LG KP500 appear as Apple iPhone: wide screen with a little access panel, including its slim body. However, bids are not like the interface for the new LG. previously existed Viewty. With the price a bit cheaper, offering a sense a new cookie with the User Interface as Samsung F480. As a first generation mobile phone technology that has flash Active Users Interface circulating in Southeast Asia, it seems KP500 product will be testing this vendor Korea. Display similar physical KP500 Cookie ini9 indeed not the first issued by LG. previously, there KS20 and some other models. The direct effect of interest visible from the mobile phone is slim. You never feel the iPhone, surely will be more comfortable holding KP500 Cookie. Slim and elegant, is not the main benefits of the construction KP500, the selection of materials used is also selective. See a plastic cover that is used, quite good and of high quality. Although based glossy, but not slippery in the hand. Usually, the mobile phone with touch screen will be bothered to lock the screen, often called a keypad lock. In this mode, you can not change or access the menu on the lock before it opened. Here, KP500 Cookie also smart to bring the key with a special icon with the "padlock" of its position in the right side of the body, a path with the SHUTTER button and the camera microSD card slot. Meanwhile, on the opposite side you will find the volume keys and the port data cable and handsfree. Another one, a pen stylus for the LG KP500 is the basis, not sideways like other touch screen mobile phone. With this concept LG can save a little physical dimensions. Smart. 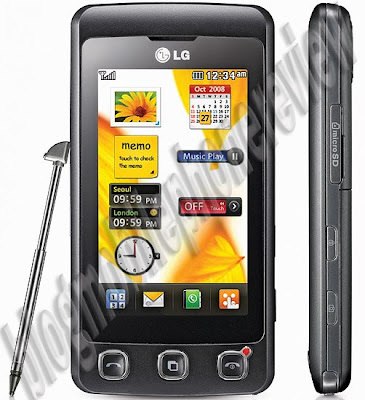 Such as the LG KS20 does not have the operating system Windows Mobile, LG KP500 only run on Java MIDP 2.0 platform. This can be seen from the entire mobile phone interface that is not much different than any other mobile phone. However, with this base Java LG Cookie is possible to explore a variety of application / game platform MIDP or J2ME. Different, LG KP500 Cookie has been using Active flash interface technology. The result, the menu more attractive and so users can more easily access and explore the functions and features that are there, with just a touch of the smooth surface of the screen. However, if compared to the property of HTC TouchFLO technology and property MultiTouch iPhone, KP500 Cookie is still quite strong. Interestingly, in the main we can create with the various modes and forms. For example, you can replace the icon or shortcut menu hours to all other directions. Quite intelligent and interesting. Strength of the camera that brought LG KP500 Cookie standard only. Only 3.2 megapixel, with a maximum range of image resolution 2048x1536 pixels. Concerning the quality, of course the usual course. In fact, still quite strong compared to the camera 2 megapixel Sony Ericsson K750i. moreover, the phone is not supported by the flash. However, for taking pictures at the level of light bright enough, the results are middling good. Maximization facilities for the camera, we can use as is. Just a Color Effects, White Balance, night mode and self timer, and do not expect to find features and photo blogging Geotag, such as mobile phone camera of the present resolution also above the 5 megapixel. Such as photos, video recorder also appear as is. Format film clips that can be made is with 3gp speed 12 fps, with a maximum QVGA resolution (320x240 pixels). The resulting picture is less smooth and still looks broken. If the camera is less impressive, the multimedia can be a little to cover the shortfall. For example, the music player. For audio codecs, KP500 LG player can play MP3, AAC, AAC +, WMA and RA. Audio sizeable hard. But still soft and comfortable on the ear. Compare with some other mobile music vendors, such as the Sony Ericsson Walkman and Nokia XressMusic. Average quality of the loudspeaker they are still less powerful than if KP500. However, when using a headset, of course, the quality is far more formidable Sony Ericsson and Nokia. In addition to music, LG KP500 Cookie is also preparing an alternative to FM radio through the second. However, as usual to activate this menu you have to use a headset that also functions as an antenna. Other advantage of the LG KP500Cookie is the ability to play games based on the movement sensor. Similar to the Sony Ericsson F305, which also use the same motion sensor game. However, this technology is still less than Accelerometer that mostly used the latest Nokia mobile phone gaming. In addition to entertainment, the LG KP500 can be taken seriously. Evidence, this could be the phone modem internet network via EDGE and GPRS. Unfortunately, there is no path in 3G/HSDPA phone. The ability to browse the internet, KP500 Cookie supported WAP 2.0 browser. Meanwhile, for this model phone connection on the data cable and LG typical Bluetooth v 2.0 + ERD. Phone using a standard battery type Lithium Ion. Sizeable capacity for large size-class mobile phone LG KP500 Cookie, which is 900 mAh. Because the facility was also not too wasteful of energy, so for once fully charging, the battery KP500 can survive up to 2.5 days. See the concept offered through LG KP500 Cookie, including features that support was, it seems to create an alternative so you can not try the iPhone. Moreover, the price offered is also quite affordable. However, poor access to data via the 3G network is not supported by this phone, and the performance of the camera still does not appear to be so short of the maximum which is very visible.